Sand Springs native Daton Fix added another pair of impressive accolades to his ever-growing resume Saturday. The Oklahoma State University redshirt freshman earned All-American status with a second-place finish at the NCAA Wrestling Tournament. Fix was a four-time undefeated State Champion at Charles Page High School and recently won the Big 12 title at 133 pounds. In the NCAA finals he fell 4-2 in sudden victory overtime to Nick Suriano, who he has a longstanding rivalry with. Suriano shares a nearly identical resume with the Cowboy. Four-time undefeated New Jersey Champion, Big Ten Champion, and NCAA finalist. Both have spent time ranked first in the nation throughout high school and college, and now they have a split 2-2 record. Fix won their first meeting in an ultimate tie-breaker at the 2014 Cadet National finals, but Suriano paid it back later that year. The Jersey wrestler scored a takedown 26 minutes into overtime for a 3-1 win at the FloWrestling Who’s Number One event. The two set the all-time record for longest high school match at 32:12. Five years later, Fix took the lead in the series in a dual between Oklahoma State and Rutgers in January. He got the win in overtime after Suriano was penalized for hands to the face. Saturday’s bout went the way of the first three. Each wrestler scored a single escape in regulation and went scoreless in the first sudden victory period. Fix took a 2-1 lead with a stalling point in the second tiebreaker, but Suriano got the escape in the final moments to force another overtime. Finally, Suriano scored a takedown for the win. The match was not without controversy. Fix fans objected to a stalemate call in overtime that led to Suriano’s escape, and wanted a penalty on Suriano for contact with Fix’s headgear moments before the takedown. On the other side of the fence, Suriano backers criticized Fix’s lack of aggression, believing he should have been called for stalling on multiple occasions. Fix started the season 21-0 with a 26-straight win streak dating back to his 2018 redshirt season, and ended with a 35-2 overall record. He had the second-best win percentage (.945) at 133 pounds, trailing only third-place finisher Stevan Micic (19-1), and the second-most total wins, trailing only DJ Fehlman (36-8). In addition to his Big 12 title, Fix also won the Oklahoma City Open, the Reno Tournament of Champions, and the Southern Scuffle. His only loss besides Suriano was to ACC Champion Micky Phillippi (21-4), who was eliminated one round-short of All-American status. He defeated five of the eight 133-pound All-Americans this season, including Suriano, Luke Pletcher, Austin DeSanto, John Erneste, and Ethan Lizak. Fix was the tenth Oklahoma State freshman to make it to the NCAA finals. He had the best NCAA finish for an OSU freshman since 2003, and he is the 38th All-American freshman in OSU history. Oklahoma State placed third in team standings with 84 points, trailing Penn State (137.5) and Ohio State (96.5). Iowa finished fourth with 76. The Pokes didn’t crown any champions, but had five All-Americans in Fix (2nd), Derek White (2nd), Preston Weigel (3rd), Nick Piccininni (5th), and Dakota Greer (7th). The Pokes went 15-0 in dual action and won their seventh-straight Big 12 Title. They will graduate three of their nine NCAA qualifiers, including Weigel and White. 132 No. 4 Reece Witcraft, two-time State Champion from Broken Arrow, Oklahoma. 132 Colt Newton, three-time State Finalist from Choctaw, Oklahoma. 152 Chance McLane, three-time State Champion from Bozeman, Montana. 160 No. 2 Brevin Balmeceda, three-time State Champion from South Dade, Florida. 160 No. 11 Dan Manibog, three-time State Champion from Katy, Texas. 170 Cade Lindsey, State Champion from Derby, Kansas. 182 Triston Wills, two-time State Champion from Derby, Kansas. Charles Page High School senior Scott Patton was named to the Oklahoma Coaches Association All State Wrestling Team Tuesday. He will compete on the Large East team in a dual on July 24th. Patton went 7-2 as a freshman and placed fifth at the Jay Hancock Memorial. He didn’t compete his sophomore year but earned a starting spot and a 28-20 record as a junior. That year he placed sixth at the Perry Tournament of Champions, 20th at the Kansas City Stampede, fourth at the Bobby Lyons Invitational, and fourth at the Regional Championship. Patton’s senior year was a dream. He had the best record on the team at 31-2 and won thirty-consecutive matches. He led the team in reversals, was second in takedowns and match points, and fourth in team points. He placed third at Perry, won the Cushing Tiger Invitational, the Jerry Billings Invitational, and the Regional Championship, and placed second at the State Tournament. His only losses this season were to two-time Kansas State Champion Montez Robinson and two-time Oklahoma State Champion Drake Vannoy. He went 2-1 against Vannoy this season, beating him in a dual and in the Regional finals. In his career Patton went 66-24 with 24 falls, 3 tech falls, 15 major decisions, 124 takedowns, 175 nearfall points, 61 reversals, and 622 match points. The All State dual will be held Wednesday, July 24th at 7:00 p.m. at the Ed Dubie Field House in Sand Springs. Patton will meet Duncan’s Hunter Jump (137-15), a two-time State Champion and four-time Finalist at the 5A level. Charles Page High School graduate and Oklahoma State University red-shirt freshman Daton Fix (30-1) is headed to the NCAA National Wrestling Championship next week in Pittsburgh, and he got a huge vote of confidence from the seeding committee on Wednesday. Fix earned the No. 1 seed after winning the Big 12 Conference Championship last weekend in Tulsa. The Big 12 is the second-best represented conference at the tournament with 62 qualifiers. The Sandite pinned Rylee Molitor in 6:01, and defeated No. 16 Matthew Schmitt 6-1, No. 12 Montorie Bridges 4-2, and No. 29 Gary Joint 7-3 at the Big 12 Tournament, helping the Pokes to their seventh-straight team title. He was one of six Cowboys to earn individual gold. The NCAAs are a double-elimination tournament with 33 qualifiers per weight class. The top eight finishers will earn All-American status. The first two rounds of the tournament will be held Thursday, followed by the quarterfinals and semis on Friday, and the Championship rounds Saturday night. In his first match, Fix will take on the winner of No. 32 Devan Turner vs. No. 33 Zack Trampe. He already has wins over eleven 133-pound NCAA Qualifiers, including the defending Champ, No. 3 Nick Suriano (24-3). Fix’s biggest challengers are both on the opposite side of the bracket. He only beat Suriano in an overtime tie-breaker with a controversial hands-to-the-face penalty. No. 2 Stevan Micic (14-0) is undefeated and also has a 3-2 win over Suriano but is wrestling injured and defaulted his last three matches of the Big Ten Tournament. No. 7 Austin DeSanto (18-4), No. 13 Austin Gomez (21-5), and Bridges (29-8) are all tough competitors who lost to Fix by two points or less. Gomez and Bridges are both on Fix’s side of the bracket, as is No. 4 Mickey Phillipi (19-2) who upset Fix 3-1 and Suriano 11-3. No. 3 Nick Suriano (Rutgers) 3-2 TB. No. 6 Ethan Lizak (Minnesota) 6-1. No. 7 Austin DeSanto (Iowa) 2-0. No. 8 John Erneste (Missouri) 9-2. No. 12 Montorie Bridges (Wyoming) 4-2, 3-0. No. 14 Austin Gomez (Iowa State) 5-4, 6-3. No. 16 Matthew Schmitt (West Virginia) 6-1, 8-2. No. 17 Sean Nickel (CSU Bakersfield) 18-3, 3:56. No. 18 Gary Wayne Harding (North Carolina) 10-2. No. 20 Brandon Paetzell (Lehigh) 7-1. No. 29 Gary Joint (Fresno State) 7-3. In a season filled with adversity, the Sandites got a good look at the resiliency of their program. For the second straight year the Minutemen took tough losses but found ways to reload and make another solid run at the gold. University of Oklahoma All American Jarrod Patterson took over a program that had finished top-four in the state six years running. The season didn’t end on a strong note, but it started hot and was an exciting ride with a 15-5 dual record, a District title, and a lot of wins along the way. The Charles Page wrestlers won their first five duals of the year before falling to the eventual State Champions, nationally ranked No. 18 Broken Arrow. They rebounded with their fourth-straight District title, went 4-3 at a loaded Ram Dual Tournament, won homecoming, and made it to the Dual State Semifinals. Of the five teams they lost to, three went on to win State titles. They finished top-four at the Perry Tournament of Champions, the Jerry Billings Invitational, and the 6A-East Regional with six individual champions along the way. They qualified six for State, four earned medals, and five will return next season. The Minutemen had to settle for seventh place at the State Tournament due to an injury-depleted roster, but top seven out of 32 teams is still a respectable finish. Josh Fincannon placed fourth at Cushing and Sapulpa and eighth at Kansas City. A likely State Qualifier, he was unable to compete at Regionals due to a battle with appendicitis He notched a 3-2 decision over Alabama State Champion Isaac McAdams. Freshman Christian Forbes placed fifth at Perry and Glenpool and sixth at Cushing. He won 5-0 against Kansas State Finalist Trent Clements and pinned State Finalist Brody Gee. Freshman Kaden Glass placed tenth at Kansas City, third at Cushing, second at Sapulpa and Regionals, and won the Junior High Allstate title. He won 7-4 against State Finalist Nico Lopez. Freshman Blake Jones placed third at both Perry and Regionals, and won the Junior High Allstate title. He won 4-1 over State Finalist Dylan Brown. Seth Jones placed fourth at Perry, fifth at Sapulpa, third at Regionals and fourth State. He pinned Kansas State Finalist Kael Pappan and dealt State Champion Zach Blankenship his only loss of the season. Chris Kirby placed fourth at Perry, thirteenth at Kansas City, second at Cushing, first at Sapulpa, third at Regionals, and fourth at State. He pinned Kansas State Finalist Nolan Craine and Texas State Champion Mario Danzi, and led the team with thirty falls. Scott Patton was the star of the season. The senior became only the fifth Sandite of the 21st century to win thirty-consecutive matches. He placed third at Perry, won Cushing, Sapulpa, and Regionals, and finished second at State. His only losses were close decisions to two-time Arkansas State Champion Montez Robinson and two-time State Champion Drake Vannoy. Patton actually defeated Vannoy twice but was battling through injury at State. He also defeated State Finalist Abel Perez and two-time State Champ Hadyn Redus. Two-time State Champ Riley Weir had an injury-plagued senior season and was unable to defend his title. He placed sixth at KCI and third at Sapulpa, notching wins over Kansas State Finalist Zach Keal, two-time Missouri State Champion Karter Brink, and State Finalist Jared Hill. Brendon Wiseley became the first-ever OSSAA State Qualifier with a prosthetic leg and ended the season as a State Finalist. He placed third at Perry, twelfth at KCI, third at Sapulpa, first at Glenpool, and first at Regionals. Of his twelve losses, all but three came at the hands of State Finalists. He defeated Kansas State Finalist Trent Clements at Perry, and went on a fourteen-match win streak near the end of the season. Patton, Weir, Taylor, and Justin Smith were the only seniors, so the Sandites will be in good shape next season with a loaded roster of experienced talent. The Charles Page High School varsity wrestling team finished top-seven in the State for the eighth-straight year, earning four medals in the OSSAA 6A State Tournament. The team qualified six wrestlers for the tournament and sent two to the finals. Only one of the qualifiers will not be returning next season. Brendon Wiseley and Scott Patton came in runner-up, Seth Jones and Chris Kirby placed fourth, and freshmen Blake Jones and Kaden Glass didn’t place. Patton was the only senior. Sand Springs placed top-three in the tournament for four straight years, but battled adversity this season. They lost State Champion Carter Young and State Runner-Up Kaleb Tabor to transfers, and State Champion Riley Weir and State Qualifier Dayvon Taylor were unable to finish the season due to injuries. Nationally-ranked No. 17 Broken Arrow won their tenth State title by a wide margin with three State Champions and seven Finalists. Of the eight returning 6A State Champions only four defended their titles. Reece Witcraft and Drake Vannoy won their second titles. Broken Arrow senior Zach Marcheselli and Choctaw senior Zane Coleman each finished their high school careers as four-timers. The historic Perry program added to their team title national record, winning their 43rd State tournament in the 3A division. They crowned three Champions, bringing the school total to 113 individuals with 173 medals. Nationally-ranked No. 9 Tuttle crushed the 4A competition for their sixteenth title with six champions. Highway 20 rivals Collinsville and Skiatook split the 5A title with 137 points each. Collinsville crowned four champions and Skiatook had three. Two teams haven’t shared a title since 1932 when there was only one classification and Tulsa Central and Cushing tied. 106: Cruz Aguilar FALL Brendon Wiseley - 2:56. 113: Tucker Owens 9-0 Jackson Cockrell. 120: Zach Blankenship FALL Jared Hill - 5:12. 126: John Wiley 5-1 Carter Young. 132: Reece Witcraft 6-3 Zeke Washington. 138: Spencer Schickram 10-0 Blake Gonzalez. 145: Gabe Johnson 9-4 Micah Lugafet. 152: Drake Vannoy 5-1 Scott Patton. 160: Tate Picklo FALL Rene Martinez - 1:49. 170: Zane Coleman 1-0 Bryce Mattioda. 182: Emmanuel Skillins 5-1 Taylor Fleming. 195: Judson Rowland 11-10 Carson Savage. 220: Zach Marcheselli 10-4 Jake McCoy. 285: Marquonn Journey 3-1 Caleb Orr. Charles Page High School junior Chris Kirby took fourth place at 160 pounds at the OSSAA 6A State Wrestling Tournament Saturday evening in Oklahoma City. The Sandite lost his first match 14-8 to Putnam City senior Rene Martinez (28-3), but won twice in consolation before falling in the placement match. He pinned Jenks junior Killian McGrew in 1:34 and scored an 8-4 decision against Broken Arrow junior Tye Rozell (25-9) to clinch a placement match. In the consolation finals he was teched 23-8 by Owasso junior Nate Jacobson. Kirby finished the season with a 36-14 record and his second State Tournament medal. He also placed fourth as a sophomore and holds a 58-24 career record. Kirby placed fourth at Perry, third at Regionals, second at Cushing, and first at Sapulpa. He also recorded a team-best thirty falls. Charles Page High School senior Scott Patton wrestled through an injury for second place in the 152-pound bracket at the OSSAA 6A State Wrestling Tournament Saturday evening in Oklahoma City. 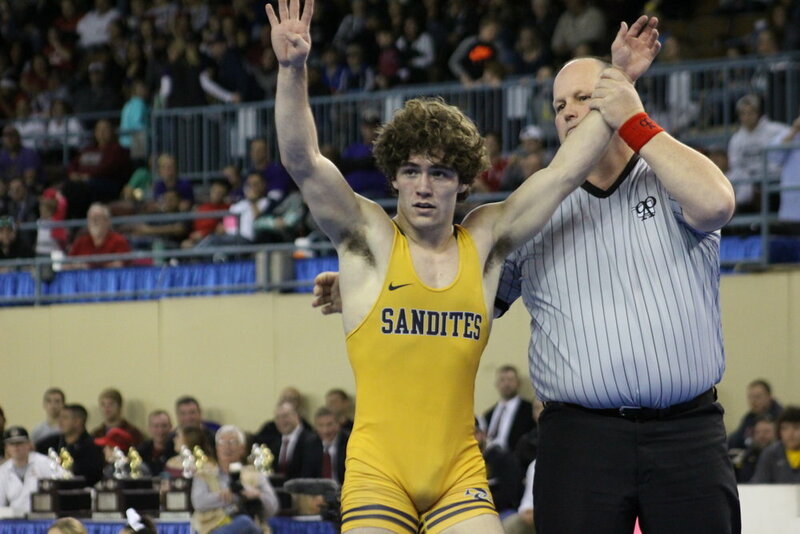 The Sandite lost his second match of the season, then rattled off 31 consecutive victories before falling to the defending State Champion, who he had previously beaten twice this season. Patton won 13-0 against Southmoore sophomore Joe Stover (37-10) and 6-1 over Broken Arrow senior Diego Maturino (33-14) to make his way to the finals. There he fell 5-1 to defending State Champion Drake Vannoy (35-11), a junior from Jenks. Patton previously defeated Vannoy 6-2 in a dual, and 4-2 in the Regional Tournament, but was unable to repeat. The Trojan scored takedowns in the first and second periods and the injured Sandite could only manage an escape. Patton finished the season 31-2 with a 66-24 career record. As a senior he placed third at Perry, first at Cushing, first at Sapulpa, and first at Regionals. This is Vannoy’s second-straight year beating a Sandite in the finals. He won his first title 5-3 against Kaleb Tabor, who transferred to Berryhill this past summer. Charles Page High School junior Seth Jones took fourth place at the OSSAA 6A State Wrestling Tournament Saturday afternoon in Oklahoma City. He made his way to the 126-pound consolation finals with a payback pin of Broken Arrow sophomore Blazik Perez (28-11), who had previously defeated him twice this season, but lost the placement match to Deer Creek sophomore Cade Manion (37-7). Manion beat him 5-1 in the quarterfinals and 9-2 in placement. Jones got a lucky break in the consolation quarterfinals, receiving a medical forfeit from former State Champion Laif Jones (32-5) who had previously bested him twice this season. Jones finished the season with a 22-15 record, bringing his career total to 44-29. He also qualified for State last season but did not place. He placed fifth this season at Sapulpa, fourth at Perry, and third in the Regional Championship. Former Sandite Carter Young (42-4), who transferred to Stillwater after winning State as a freshman, settled for second place at 126, falling 5-1 to Mustang freshman John Wiley (29-3). Charles Page High School junior Brendon Wiseley settled for second place in the 106-pound bracket at the OSSAA 6A State Wrestling Tournament Saturday evening in Oklahoma City. Wiseley won a 7-0 decision over Mustang freshman Shelton Chastain (32-18) in the quarterfinals and a 6-2 decision over Owasso senior Jared Campbell (34-9) in the semifinals before falling to Edmond Memorial junior Cruz Aguilar (25-3). Aguilar took a 10-2 lead, giving up only an escape and a penalty point before pinning the Sandite at 2:56. Wiseley finished the season with a 38-12 record and is 52-20 in his career with one more year to compete. He ended the year with nineteen pins and four technical falls, placing third at Perry, third at Sapulpa, first at Glenpool and first at Regionals. The Charles Page High School wrestling team is sitting in fifth place after day one at the OSSAA 6A State Tournament. The Sandites sent two to the finals and have three still in contention on the back side of the bracket. Top-ranked 106-pound junior Brendon Wiseley (38-11, 52-19) won a 6-2 decision over Owasso senior Jared Campbell (34-7) in the semifinals. Campbell scored a takedown in the second period, but Wiseley scored a takedown in the first, a reversal in the third, and a pair of escapes for the win. He will wrestle Edmond Memorial junior Cruz Aguilar (24-3) in the finals. Top-ranked 152-pound senior Scott Patton (31-1, 66-23) won his thirtieth-straight match 6-1 over Broken Arrow senior Diego Maturino (33-13) in the semifinals. Patton scored a takedown, a reversal, and a set of nearfall points in the win. In the finals he will take on defending State Champion Drake Vannoy (35-11), a junior from Jenks. Patton has previously beaten Vannoy twice this season. Freshman Kaden Glass (32-10) fell to top-ranked 195-pound Deer Creek senior Carson Savage (37-2) in the semifinals. Glass scored a takedown midway through the first period, but Savage worked up a 6-2 lead before pinning the Sandite. Glass will take on Union senior Elijah Tomlin (37-8) in the Consolation Semifinals. He is 3-0 against Tomlin this season. 160-pound junior Chris Kirby (35-13, 57-23) took down Jenks junior Killian McGrew in consolation. McGrew scored an early takedown, but Kirby reversed and pinned the Trojan in 1:34. He will wrestled Broken Arrow junior Tye Rozell (25-8) on Saturday. Rozell edged out the Sandite 8-7 in a regular season dual. 126-pound junior Seth Jones (21-14, 43-28) got a lucky break in the consolation quarterfinals, receiving a medical forfeit from former State Champion Laif Jones (32-4) who had previously bested him twice this season. He will wrestle Broken Arrow sophomore Blazik Perez (28-10), who has defeated him twice this season by close decisions. Freshman Blake Jones (26-14) was eliminated from contention at 132 pounds after falling 6-3 to Deer Creek senior Bobby Robinson (26-17) in consolation. Former Sandite and defending State Champion Carter Young (42-3, 82-4) is headed to the finals at 126. Young transferred to Stillwater after winning State as a freshman. The consolation matches will begin at 10:30 a.m. on Saturday. 106: Cruz Aguilar v. Brendon Wiseley. 113: Tucker Owens v. Jackson Cockrell. 120: Jared Hill v. Zach Blankenship. 126: Carter Young v. John Wiley. 132: Zeke Washington v. Reece Witcraft. 138: Blake Gonzalez v. Spencer Schickram. 145: Gabe Johnson v. Micah Lugafet. 152: Drake Vannoy v. Scott Patton. 160: Tate Picklo v. Rene Martinez. 170: Zane Coleman v. Bryce Mattioda. 182: Taylor Fleming v. Emmanuel Skillings. 195: Carson Savage v. Judson Rowland. 220: Jake McCoy v. Zach Marcheselli. 285: Marquan Journey v. Caleb Orr. Three of the six Charles Page High School wrestling State Qualifiers won their quarterfinal matches Friday morning in Oklahoma City, and the Sandites are currently tied for seventh in the Class 6A team standings. Top-ranked 106-pound junior Brendon Wiseley (37-11, 51-19) won a 7-0 decision over Mustang freshman Shelton Chastain (32-17). Wiseley scored takedowns in all three periods and an escape in the third. He will take on Owasso senior Jared Campbell (34-7) in the semifinals. Campbell pinned Wiseley in a dual earlier this season, but the Sandite got payback with a 6-2 decision at the Glenpool tournament. Top-ranked 152-pound senior Scott Patton (30-1, 65-23) won his 29th-straight match 13-0 against Southmoore junior Joe Stover (37-9). Patton scored takedowns in the first and third periods, a reversal in the second, and three sets of nearfall points. He will wrestled Broken Arrow senior Diego Maturino (33-12) in the semifinals. Patton previously bested Maturino 9-6 in a dual. 195-pound freshman Kaden Glass (32-9) won a 15-9 decision over Moore junior Tristan Ashford (20-8) in the quarterfinals. Ashford scored a takedown and a reversal in the first period, but only managed escapes for the remainder of the match. Glass notched five takedowns and a set of nearfall points. He will wrestle top-ranked Deer Creek senior Carson Savage (36-2) in the semifinals. 160-pound junior Chris Kirby (34-13, 56-23) fell 14-8 to Putnam City senior Rene Martinez (27-2) in the quarterfinals. Kirby scored two reversals and nearly pinned Martinez midway through the third, but the Pirate reversed and maintained control for the rest of the bout. The Sandite will take on Jenks junior Killian McGrew in consolation. McGrew pinned Kirby in a dual, but Kirby pinned him back at Regionals. 126-pound junior Seth Jones (20-14, 42-28) fell 5-1 to Deer Creek sophomore Cade Manion (35-6). He will wrestle former State Champion Laif Jones (32-4) in consolation. The Bartlesville senior has wins of 9-0 and 6-4 against the Sandite. 132-pound freshman Blake Jones (26-13) fell 15-3 to Choctaw senior Colt Newton (30-5). He will wrestle Deer Creek senior Bobby Robinson (25-17) in consolation. Former Sandite and defending State Champion Carter Young (41-3, 81-4) won his quarterfinal bout 8-0 over Choctaw freshman Shawn Muse (30-10). Young transferred to Stillwater after winning State as a freshman. The first round of consolations will begin Friday at 5:30 p.m. followed by semifinals at 7:45 p.m.
106: Cruz Aguilar v. Cooper Evans. 106: Jared Campbell v. Brendon Wiseley. 113: Tucker Owens v. Jason Gilbert. 113: Garrett Johnson v. Jackson Cockrell. 120: Nate Becker v. Jared Hill. 120: Corwin Strachan v. Zach Blankenship. 126: Carter Young v. Blazik Perez. 126: Cade Manion v. John Wiley. 132: Jackson Oplotnik v. Zeke Washington. 132: Colt Newton v. Reece Witcraft. 138: Peter Rolle v. Blake Gonzalez. 138: Cameron Picklo v. Spencer Schickram. 145: Gabe Johnson v. Jaxon Randall. 145: Micah Lugafet v. Ja’len Hernandez. 152: Brett Black v. Drake Vannoy. 152: Diego Maturino v. Scott Patton. 160: Tate Picklo v. Tye Rozell. 160: Rene Martinez v. Charles Floyd. 170: Zane Coleman v. Braden Bowman. 170: Christian McCutcheon v. Bryce Mattioda. 182: JT Stambeck v. Taylor Fleming. 182: Brannigan Reyes v. Emmanuel Skillings. 195: Carson Savage v. Kaden Glass. 195: Judson Rowland v. Gavin Potter. 220: Jared Galli v. Jake McCoy. 220: Micah Walker v. Zach Marcheselli. 285: Marquan Journey v. Noah Cortes. 285: Colten Dodd v. Caleb Orr. The Class 6A No. 5 ranked Charles Page High School wrestling team crowned two Champions at the OSSAA 6A-East Regional Tournament Saturday and qualified six for the State Tournament. Brendon Wiseley (106) and Scott Patton (152) won the tournament. Kaden Glass (195) was Runner-Up. Seth Jones (126), Blake Jones (132), and Chris Kirby (160) all placed third. No. 1 Broken Arrow won the tournament handily with 302.5 points, twelve finalists, and six champions. No. 4 Edmond North took second with 169.5 points, four finalists, and one champion. Sand Springs won a four-way race for third place with 139.5 points. Owasso was fourth with 138.5 points and three finalists. Bartlesville was fifth with 138.0 points and one champion. Jenks was sixth with 133.0 points, two finalists, and one champion. The State Tournament will be held at Jim Norick Arena at the Oklahoma State Fairgrounds this Friday and Saturday. This Friday marks the beginning of the 98th annual OSSAA State Tournament and the eleventh 6A tournament. Of the 140 wrestlers competing in the tournament, seventeen are freshmen, 23 are sophomores, 51 are juniors, and 49 are seniors. 68 are returning State Qualifiers, fifteen are returning Finalists, and eight are defending State Champions. Cade Nicholas, Carter Young, Laif Jones, Reece Witcraft, and Drake Vannoy each hold one title apiece. Gavin Potter has two titles. Zane Coleman and Zach Marcheselli have three titles each. Nicholas and Young both won their titles as freshmen. 5:15 p.m. Academic State Champion Presentations. 5:30 p.m. First Round Consolations. 6:00 p.m. Finals and Award Presentations. Sand Springs Junior Brendon Wiseley (36-11, 50-19) is top ranked at 106. He has wins over Colby Strachan, Ethan Kemble, Bryce Cockrell (31-9), and Jared Campbell (33-7). He’s not unbeatable, however. He split wins with Campbell this season. On the west side of the bracket are Edmond Memorial junior Cruz Aguilar (22-3) and Westmoore sophomore Cooper Evans (31-2) who both boast better records than Wiseley, but with less ranked wins. Evans is the only returning State Qualifier. Cruz Aguilar v. (Colby Strachan v. Clayton Knapp). Cooper Evans v. Bryce Cockrell. Cooper Mahaffey v. Jared Campbell. Brendon Wiseley v. (Shelton Chastain v. Ethan Kemble). Mustang Sophomore Tucker Owens (26-1) is the returning State Runner-Up and already has mostly dominant wins over Jason Gilbert (27-8), EJ Tecson (28-9), Garrett Johnson (27-8), Jackson Cockrell (33-7), and Dominic Derr. His only loss this season was to nationally-ranked No. 4 Anthony Ferrari of New Jersey. Cockrell, a Broken Arrow junior, is Owens’s top challenger, holding wins over Gilbert, Tecson, and Johnson. While Owens blew out most of his ranked competitors, he only beat Cockrell 6-4. Derr, Gilbert, Johnson, and David Boucher (30-9) are also returning State Qualifiers. Tucker Owens v. (Caleb Nahmahpeah v. Hayden Brown). Jason Gilbert v. EJ Tecson. Garrett Johnson v. David Boucher. Jackson Cockrell v. (Dominic Derr v. Isaiah Smith). Bixby freshman Zach Blankenship (40-1) won Junior High Allstate and every other tournament he’s been in with one of the best pin records in the state. He has wins over Nate Becker, Landon Valenzuela, Cade Nicholas (35-7), Jared Hill (28-11), and Corwin Strachan (34-6). Strachan, a Bartlesville senior, has more mat experience and could give Blankenship a run for his money. Blankenship has two wins over Strachan, but both were only 5-4 decisions. Strachan has wins over Becker and Hill. Edmond Memorial freshman Jake McCain (22-5) won the West Regional and has wins over Valenzuela, Nicholas, and Manny Rogers (26-6). Nicholas (35-7) is a 3A State Champion transfer from Perry and Stillwater sophomore. Becker is the only other returning State Qualifier. Jake McCain v. (Nate Becker v. Landon Valenzuela). Cade Nicholas v. Jared Hill. Romanual Rogers v. Corwin Strachan. Zach Blankenship v. (Jacob Zimmer v. Jordan Lomeli). Three State Champions will converge at 126. Stillwater sophomore Carter Young (40-3), Bartlesville senior Laif Jones (32-3), and Choctaw freshman Junior High Allstate Champion Shawn Muse (29-9). Shayden Trant and Seth Jones (25-8) are also returning State Qualifiers and Cade Manion (34-6) placed fourth last year. There’s a mess of circular losses at this weight. Young has wins over Manion, Bam West (13-4), Muse, and John Wiley. Laif Jones has wins over Seth Jones and Blazik Perez (27-9). West has wins over Muse and Wiley. Wiley has wins over Manion, Perez, and West. Perez has wins over Laif and Seth Jones, Manion, Muse, and Shayden Trant. Manion has wins over Muse and Young. Carter Young v. (Shayden Trant v. Shaun Muse). Bam West v. Blazik Perez. Cade Manion v. Seth Jones. Laif Jones v. (John Wiley v. Ahmad Alserafei). Oklahoma State-committed Broken Arrow senior, nationally ranked No. 3 Reece Witcraft (34-2) is the returning State Champion. His only losses are an injury default and a fall to No. 2 Shayne Van Ness from Blair Academy. Witcraft holds wins over Colt Newton (29-5), Keegan Luton (33-10), Zeke Washington (34-4), and Ethan Gilkey. Washington, an Owasso senior, and Newton, a Choctaw senior, are both returning State Finalists. Luton placed fourth last year, Jake Wright is a returning Qualifier, and Blake Jones (26-12) recently won the Junior High Allstate title. Edmond Memorial junior Jackson Oplotnik (20-5) won the West Regional title and has a win over Newton, but split wins with Luton. Jackson Oplotnik v. (Ethan Gilkey v. Jake Wright). Keegan Luton v. Zeke Washington. Colt Newton v. Blake Jones. Reece Witcraft v. (Bobby Robinson v. Caleb Rogers). Edmond Memorial senior Peter Rolle (30-5) won the West Regional. He’s a returning State finalist with wins over Spencer Schickram (39-2), Josh Parks, Cam Picklo (41-3), and Bryce Petering. Mustang Senior Cameron Picklo is a returning State Qualifier and settled for second in the west, but has pinned Rolle in the past and also has wins over Parks, Brayden Strachan (37-6), Blake Gonzalez (21-7), Parker Wright (32-8), and Brandon Elrod. Wright, Strachan, Schickram, Elrod, Petering, and Parks are all returning State Qualifiers and Gonzalez placed third last year. Schickram is a Ponca City senior and East Regional Champ with wins over Wright, Rolle, Strachan and Gonzalez. Peter Rolle v. (Branden Elrod v. Bryce Petering). Parker Wright v. Blake Gonzalez. Cameron Picklo v. Brayden Strachan. Spencer Schickram v. (Traylon Jackson v. Josh Parks). Choctaw junior Gabe Johnson (37-2) is a returning State Finalist and the top-ranked wrestler at 145. He has wins over Micah Lugafet (23-1), Ja’len Hernandez (35-5), and Enrie Chavez. His only losses this season were to three-time Oregon State Champion Legend Lamer and four-time Utah State Champ Zak Kohler. Enid freshman Chance Davis (21-5) recently placed second at Junior High Allstate. Lugafet placed third at State last year, Hernandez placed fourth, and Bryce Corona, Christian Webb, and Roarke Simpson are all returning qualifiers. Hernandez, a senior from Union, has wins over Webb, Chavez, Chance Davis, and Jaxon Randall (24-11). Gabe Johnson v. (Christian Webb v. Roarke Simpson). Tanner Robinson v. Jaxon Randall. Micah Lugafet v. Chance Davis. Ja’len Hernandez v. (Bryce Corona v. Enrie Chavez). Jenks junior Drake Vannoy (33-11) is the returning State Champion with wins over Jayden Villalobos, Joseph Sylvester (26-14), and Diego Maturino (32-12). He’s not the favorite, however. Sand Springs senior and returning State Qualifier Scott Patton (29-1) hasn’t lost since the second match of the season and has wins over Maturino, Villalobos, and two decisions over Vannoy. Sylvester and Kyle Knowles (28-6) are also returning State Qualifiers. Joseph Sylvester v. (Jayden Villalobos v. Brett Black). Kyle Knowles v. Drake Vannoy. Tim Trigg v. Diego Maturino. Scott Patton v. (Joe Stover v. Johnny Villa). Mustang sophomore Tate Picklo (40-0) is a returning State Finalist and the heavy favorite with dominant wins over Charles Floyd (26-7), Tye Rozel (24-7)l, Decklin Nagel, and Rene Martinez (26-2). Killian McGrew placed third last year, Chris Kirby (34-12) placed fourth, and Chandler Holman (26-11), Martinez, and Floyd are all returning State Qualifiers. Tate Picklo v. (Nate Jacobson v. Colby Simpson). Chandler Holman v. Tye Rozell. Rene Martinez v. Chris Kirby. Charles Floyd v. (Decklin Nagel v. Killian McGrew). Nationally ranked No. 14 Choctaw senior Zane Coleman (38-1) is a three-time defending State Champion and Arizona State commit, whose only loss came to No. 16 Peyton Craft of Blair Academy. He has wins over Bryce Mattioda (25-6), Christian McCutcheon (24-5), and Jonathan Sutter. Mattioda, a Broken Arrow junior, is a State Finalist and Neko Macias and Tyrome Denton (20-7) are also returning qualifiers. Zane Coleman v. (Laken Clowdus v. Neko Macias). Tyrome Denton v. Braden Bowman. Christian McCutcheon v. Mason Seth. Bryce Mattioda (v. Jonathan Sutter v. Tre Harley). Broken Arrow sophomore Emmanuel Skillings (38-3) didn’t compete in the post-season last year but did win the Junior High Allstate title. Two of his three losses are to State Champions, and he holds wins over Taylor Fleming (31-6), Brannigan Reyes (30-12), and Dylan Ward (27-14). Norman North senior JT Stambeck (29-1) placed third last season and his only loss this year is to defending State Champion Dustin Plott. He has wins over Reyes and Ward. Thatcher Hall placed third at the 3A State Tournament last year, and Fleming, Reyes, and Trey Bowman (27-14) are all returning qualifiers. JT Stambeck v. (Jake Rogers v. Antione Thomas). Dylan Ward v. Taylor Fleming. Brannigan Reyes v. Trey Bowman. Emmanuel Skillings v. (Noah Kenney v. Thatcher Hall). Broken Arrow senior Gavin Potter (16-3) is the defending two-time State Champion with wins over Kaden Glass (31-9), Judson Rowland (17-7), and Christian Cantu, but he’s not the favorite this year. Deer Creek senior Carson Savage (35-2) defeated Potter 9-2 in a dual, and also boasts wins over Tristan Ashford (20-7) and Rowland. Savage placed third last year. Trent Owens, Ashford, and Rowland are also returning State Qualifiers. Another tough challenger for the title is Sand Springs freshman Kaden Glass who won the Junior High Allstate title this year. 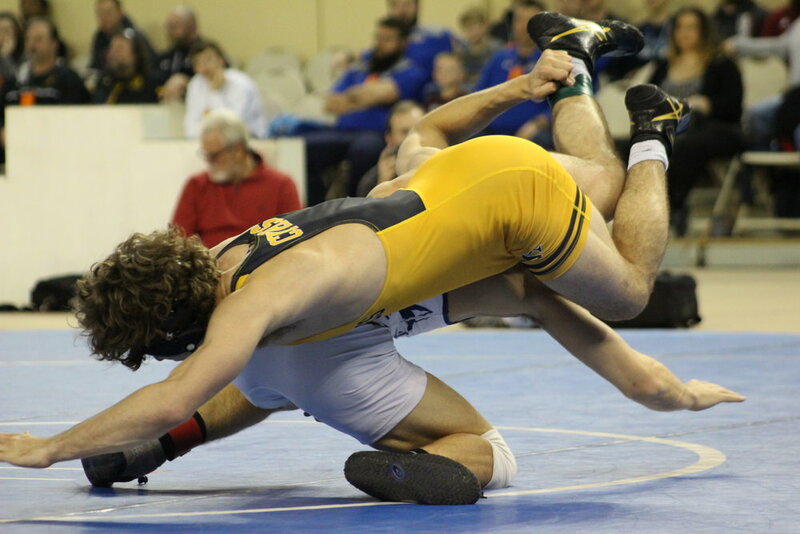 Potter has beaten Glass twice, but the Sandite scored takedowns in both meetings, and the defending Champ only won 3-2 with a trio of escapes at Regionals and needed overtime to do it. Carson Savage v. (Christian Cantu v. Conner Columbus). Tristan Ashford v. Kaden Glass. Judson Rowland v. Elijah Tomlin. Gavin Potter v. (Trent Owens v. Ethan Felts). Broken Arrow senior Zach Marcheselli (23-2) is a three-time State Champion ranked ninth in the nation. He holds dominant wins over Jared Galli, Micah Walker (36-6), Jack Kitchingham (21-16), and Jake McCoy (30-3). Edmond North senior Jake McCoy was second in the East and has wins over Rowland, Corbin Gordon (31-8), Galli, and Walker. He placed fourth at State last season. Walker also placed, Galli placed fourth, and Gordon and Tony Opichka (28-14) are both returning qualifiers. Tony Opichka v. (Jared Galli v. Carson Cottrill). Jack Kitchingham v. Jake McCoy. Corbin Gordon v. Micah Walker. Zach Marcheselli v. (Hudson Hollander v. Yemi Oyesanya). Heavyweight has four major contenders with a circle of wins. Choctaw junior Marquon Journey (33-6) and Yukon senior Ashton Aldridge (32-7) have split wins. Aldridge won a 3-2 decision, but Journey has a fall and 5-0 decision in their most recent meeting. Aldridge has a 3-2 win over Jenks senior Caleb Orr (24-6). Orr has a 3-2 win over Broken Arrow senior Noah Cortes (3-2). Cortes has a 3-2 decision over Journey and a 3-2 win over Orr. Journey, Cortes, Aldridge, Samontai Scott (10-2), and Juan Macedo are all returning State Qualifiers. Marquon Journey v. (Devion Williams v. Jaylin Parker). Samontai Scott v. Noah Cortes. Ashton Aldridge v. Colten Dodd. Caleb Orr v. (Kobe Shawver v. Juan Macedo). No. 1 Broken Arrow - thirteen qualifiers - nine State titles, last won in 2015. No. 3 Mustang - ten qualifiers - one State title in 1983. No. 8 Edmond Memorial - ten qualifiers - one State title in 1988. No. 4 Edmond North - nine qualifiers - one State title in 2013. No. 2 Choctaw - eight qualifiers - six State titles, last won in 2018. No. 6 Deer Creek - eight qualifiers. No. 7 Jenks - eight qualifiers. No. 13 Bartlesville - seven qualifiers. No. 5 Sand Springs - six qualifiers - two State titles, last won in 2017. No. 10 Stillwater - six qualifiers - eight State titles, last won in 2014. No. 15 Del City - six qualifiers. No. 9 Owasso - five qualifiers - one State title in 1978. No. 11 Union - five qualifiers - two State titles, last won in 2009. No. 12 Yukon - four qualifiers. No. 14 Ponca City - three qualifiers - eight State titles, last won in 2006. Norman North - three qualifiers. Putnam North - three qualifiers. Midwest City - two qualifiers - sixteen State titles, last won in 2008. Shawnee - two qualifiers - three State titles, last won in 1989. Putnam City - one qualifier - three State titles, last won in 1978. Bixby - one qualifier - one State title in 1987. No. 1 Broken Arrow and No. 3 Mustang won Regional titles this weekend and the season ended for all but the best wrestlers in Oklahoma. On Friday 140 athletes will converge at Jim Norrick Arena in Oklahoma City for the 98th annual OSSAA State Tournament and the eleventh 6A tournament. The 4th and 5th place wrestlers from opposite sides of the state will meet in a wrestle-in round at 9:30 a.m. on Friday, and the first round of brackets will run from 11:00 a.m. to 3:30 p.m. Sixth place finishers will qualify if one of the top five from their Region is unable to participate. The Academic State Champions will be crowned at 5:15 p.m. on Friday. The first round of Consolations will last from 5:30 p.m. to 7:40 p.m. and the Semifinals will go from 7:45 p.m. to 10:15 p.m.
Saturday’s wrestling will kick off at 10:30 a.m. with Consolation Semifinals, followed by Consolation Finals at 12:45 p.m. and Finals at 6:00 p.m. Broken Arrow leads all schools with thirteen qualifiers, followed by Edmond Memorial and Mustang with ten apiece. Edmond North qualified nine. Choctaw, Deer Creek, and Jenks qualified eight apiece. Bartlesville qualified seven. Del City, Southmoore, Stillwater, and Sand Springs qualified six. Owasso and Union qualified five. Westmoore and Yukon qualified four. Norman North, Enid, Muskogee, Ponca City, and Putnam North qualified three apiece. Midwest City, Moore and Shawnee each qualified two. Putnam City, Bixby, Norman, and Sapulpa each sent one wrestler. Charles Page High School freshman Kaden Glass (31-9) settled for second at the OSSAA 6A-East Regional Championship Saturday, but very nearly knocked off the defending two-time State Champion. He pinned Curtis Fodor in 1:07 and Luis Vega in 1:41 at 195 pounds, then edged out Elijah Tomlin 3-2 in the semifinals. In the finals he took on two time Broken Arrow State Champion Gavin Potter. Glass scored the only offensive points of the 3-2 overtime loss but Potter got the win with escapes. The Sandite scored a takedown late in the first period but cut the Tiger loose almost immediately, and also cut him to start the second period. The two went scoreless in the third period and in sudden victory overtime, but Potter rode out the first tie breaker and escaped in the second for the win. The Sandites qualified six for the State Tournament with three finalists and three consolation finalists. Brendon Wiseley (36-11, 50-19) won the 106 pound title 5-0 against Broken Arrow’s Bryce Cockrell. Seth Jones (20-13, 42-27) placed third at 126 with a 10-0 major decision against Ponca City’s Shayden Trant. Blake Jones (26-12) placed third at 132 with a 7-6 decision over Bartlesville’s Ethan Gilkey. Scott Patton (29-1, 64-23) won the 152 pound bracket with a 4-2 decision over defending Jenks State Champion Drake Vannoy. Chris Kirby (34-12, 56-22) placed third at 160 pounds with a 14-10 decision over Owasso junior Nate Jacobson. Two-time State Champion Riley Weir is out for the remainder of the season with a rib injury and ended his career with a 108-34 record. 106: Wiseley (CPHS) 5-0 Cockrell (Bartlesville). 113: Cockrell (BAHS) 4-0 Tecson (Owasso). 120: Blankenship (Bixby) FALL Hill (BAHS). 126: Jones (Bartlesville) 1-0 Perez (BAHS). 132: Witcraft (BAHS) 7-2 Washington (Owasso). 138: Schickram (PoHi) FALL Gonzalez (BAHS). 145: Hernandez (Union) 11-5 Randall (EdNo). 152: Patton (CPHS) 4-2 Vannoy (Jenks). 160: Floyd (EdNo) 3-2 Rozell (BAHS). 170: Mattioda (BAHS) FALL Bowman (EdNo). 182: Skillings (BAHS) 6-4 Fleming (Owasso). 195: Potter (BAHS) 3-2 Glass (CPHS). 220: Marcheselli (BAHS) 8-2 McCoy (EdNo). 285: Orr (Jenks) 3-2 Cortes (BAHS). Charles Page High School junior Chris Kirby (34-12, 56-22) placed third at the OSSAA 6A-East Regional Championship Saturday in Jenks, qualifying for the State Tournament at 160 pounds. Kirby pinned Noah Alexander in 2:11, Devin Cross in 0:18, Isaac Gibson in 1:56, and Killian McGrew in 3:01, then won a rematch with Owasso junior Nate Jacobson. Jacobson pinned Kirby in the semifinals, but Kirby came won a 14-10 shootout in consolation. Jacobson scored a pair of takedowns in the first but Kirby scored with sixteen seconds left to tie it at 4-4, then scored a takedown and nearfall points in the second for the 9-6 lead. Both wrestlers scored takedowns in the third, but Kirby got a trio of escapes and held on for the win. Kirby is a returning State Qualifier, placing fourth last year. He leads the team in falls with 29 this season. The No. 5 ranked Sandites are sitting in third place at the tournament with a one-point lead on Owasso and a 1.5 lead on Bartleville. The Sandites have qualified six for the State Tournament with three finalists and three consolation finalists. Kaden Glass (31-8) is aiming for the 220 title. All six Sandites are guaranteed to advance to State, but their placement will determine their seeding. 195: Potter (BAHS) v. Glass (CPHS). 220: Marcheselli (BAHS) v. McCoy (EdNo). 285: Cortes (BAHS) v. Orr (Jenks). Charles Page High School senior Scott Patton (29-1, 64-23) won the 152-pound title at the 6A-East Regional Championship Saturday in Jenks. Patton won a 4-2 decision over the defending State Champion in the finals. He pinned Spencer Shook in 5:23 and majored Jayden Villalobos 14-1 before taking on Jenks State Champion Drake Vannoy, who he also defeated 6-2 in a dual earlier this year. The two stayed neutral through the first period. Vannoy scored an escape early in the second but Patton got a takedown with fifteen seconds remaining, then reversed in the third with twenty seconds left. Patton’s only loss this season came in his second match to an out of state wrestler. He has won 28 straight matches and three tournaments, and leads the team in major decisions. Chris Kirby (33-12, 55-22) will wrestle for third at 160. 182: Skillings (BAHS) v. Fleming (Owasso). Charles Page High School freshman Blake Jones (26-12) qualified for the OSSAA 6A State Tournament with a third place performance at 132 pounds at the East Regional Championship Saturday in Jenks. He pinned Caleb Rogers in 5:26 and Logan Herrell in 2:47, decisioned Garrett Weis 8-2, teched Cason Deyalsingh 17-1 in only 3:00 and majored Carlos Arechiga 12-4. His only loss was an upset to Union freshman Caleb Rogers who pinned him in 5:26 after the Sandite led 10-3 in the third period. In the finals he got payback on Bartlesville junior Ethan Gilkey, who pinned him in a dual earlier this season. Gilkey took a 4-0 lead in the first period with a takedown and two back points, but Jones scored seven in the second with five nearfall. Gilkey picked up two points on stalling penalties in the third. The No. 5 ranked Sandites are sitting in fifth place after session three at the tournament. The Sandites have qualified six for the State Tournament with three finalists and three consolation finalists. Scott Patton (28-1, 63-23) is in the 152-pound finals. 138: Schickram (PoHi) v. Gonzalez (BAHS). 145: Randall (EdNo) v. Hernandez (Union). 152: Patton (CPHS) v. Vannoy (Jenks). 160: Floyd (EdNo) v. Rozell (BAHS). 170: Mattioda (BAHS) v. Bowman (EdNo). Charles Page High School junior Seth Jones (20-13, 42-27) qualified for the OSSAA 6A State Tournament for the second straight year after a third place performance at 126 pounds at the East Regional Championship Saturday in Jenks. Jones pinned Killian McNichol in 3:38 and Noah Smith in 1:51 before falling 9-0 to defending State Champion Laif Jones in the semifinals. In consolation he defeated Ahmad Alserafei 8-7 and majored Ponca City sophomore Shayden Trant 10-0 in the finals. Jones took Trant down with a headlock in the first period and rolled him for three, then added three more on a cradle in the second. The Sandite got two penalty points in the third to solidify the win. Brendon Wiseley won the 106 pound title 5-0 against Broken Arrow’s Bryce Cockrell. Blake Jones (25-12) will wrestle for third at 132. Charles Page High School junior Brendon Wiseley (36-11, 50-19) won the OSSAA 6A-East Regional Championship at 106 pounds Saturday afternoon in Jenks. Wiseley pinned his way to the finals, taking down Cooper Britton in 5:34, Brenner James in 1:38, and Colby Strachan in 4:27. In the finals he defeated Broken Arrow junior Bryce Cockrell 5-0. The two stayed neutral through the first but Wiseley got an escape in the second and rolled the Tiger for two pairs of back points in the third. This is Wiseley’s first year competing at Regionals. He is riding a twelve-match win streak and leads the team in technical falls, reversals, and nearfall points. Seth Jones (19-13, 41-27) will wrestle for third at 126. 126: Perez (BAHS) v. Jones (Bartlesville). 132: Witcraft (BAHS) v. Washington (Owasso).